“My lower denture is moving around–can you do something about this?” is one of the most common complaints dentists get today. Lower dentures don’t have as large an area to rest on [called the ‘seat’], and because of this, it really does not have a feel of suction like upper teeth can have. The answer to the lack of suction is called the overdenture. 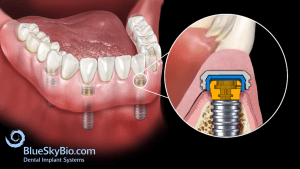 Implants are placed [usually 2 to 5] into the jaw, and after healing attachments are placed in the denture that allow them to snap into place. It is very popular and seems to be a ‘best of both worlds’ kind of answer.